For those of you needing a quick brush up on your state trivia, the nickname of Washington is the Evergreen State. While I am fairly confident that the moniker was intended to honor the abundant amounts of evergreen trees found in the state’s natural areas, sometimes I’m not so sure. Could it be that the forefathers of that great state had me in mind when the epithet was chosen? You see, although I love spending time in Washington state, I have to admit that deep inside I am crazy jealous whenever I am there. 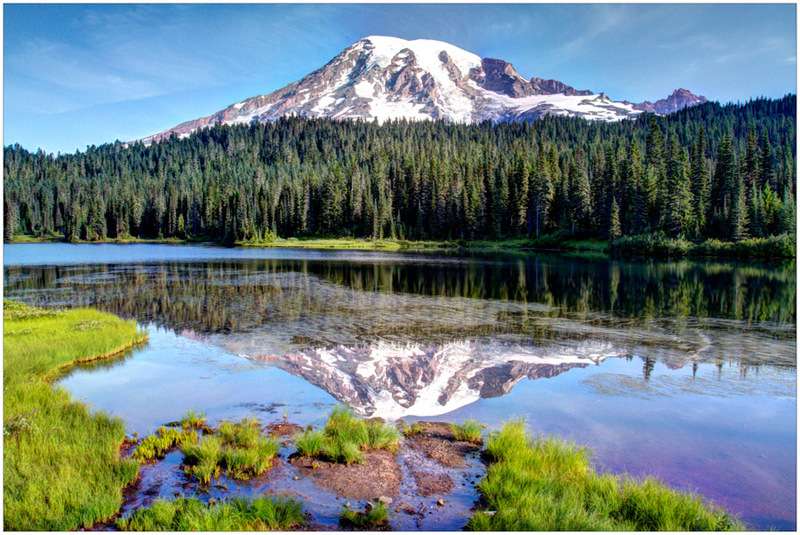 Washington is a dream come true for any nature-loving, photograph-taking, outdoor-seeking person, and being there makes me “ever-green with envy.” Do Washingtonians realize how fortunate they are to live in such a beautiful place? Is it really fair for one state to have so much? Despite my envy, when it was time for Matt to go back to school after our epic Wonderland adventure and for me to take my annual summer trip with my mother, staying on to explore more of the Evergreen State was a no-brainer. Two more weeks in paradise? Yes, please! Sign me up! Within a few hours of dropping Matt off at the airport, I had hit the grocery store, the laundromat and the gas station and was back at Sea-Tac to pick up my mother for two more weeks of outdoor fun in fabulous Washington state. As usual, we had an incredible time, packing as much in as possible. From the airport, my mother and I headed right back to Mount Rainier. With it being peak wildflower season, I wanted her to experience the Mountain in all of its grandeur. Unfortunately, after two weeks of glorious sunshine for Matt and me, the weather finally turned, and it poured cats and dogs for two days straight! We were greeted with heavy rains, zero visibility and less than ideal conditions to truly enjoy the park. Whenever the rain let up for a bit, though, we were determined to make the most of it. We opted for some short hikes to Grove of the Patriarchs and Snow Lake and took in a few beautiful waterfalls that were within striking distance of the car. On Day Two, we ventured to Paradise Meadows, one of the most beautiful and popular places in the park. Although we had some luck spotting mule deer and impressive stands of flowers, the fog was as thick as pea soup, and we could barely see the trail in front of us, much less the 14,000+ foot mountain beyond that. We finally decided to cut our losses and try a different tactic. Determined to make the most of the rainy weather, we ditched Rainier and headed to the rain forests of the Olympic Peninsula. They say there’s no better way to see a rainforest, and so if you can’t beat the rain, you might as well figure out a way to enjoy it, right? First stop was Marymere Falls where we got our first glimpse of the world of green awaiting us. 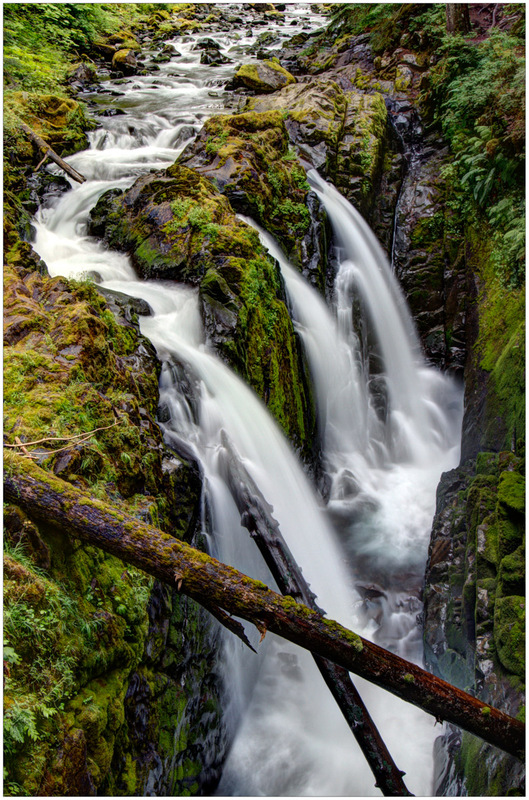 Nearby Sol Duc Falls was even more impressive. Not only was the waterfall gorgeous, but we also took advantage of the opportunity to get warm and clean at the hot springs facility located right next to the campground. My mother likes a hot bath like nobody’s business, and I enjoyed being reminded of the hot spring culture we so enjoyed while visiting Iceland. From there, we made our way to the Hoh Rainforest and found a cozy campsite under the beautiful green canopy. We were delighted when this large Roosevelt elk wandered across the river adjacent to the camp for his evening meal. There are two great trails that start directly behind the Visitor’s Center. We wandered the Spruce Nature Trail for a few miles together and admired the lush mosses growing in every hue of green imaginable. We were on our way back to camp when my mother spotted a large bird land in a tree. She wasn’t sure what it was at first, but we were delighted to discover it was none other than a beautiful barred owl. 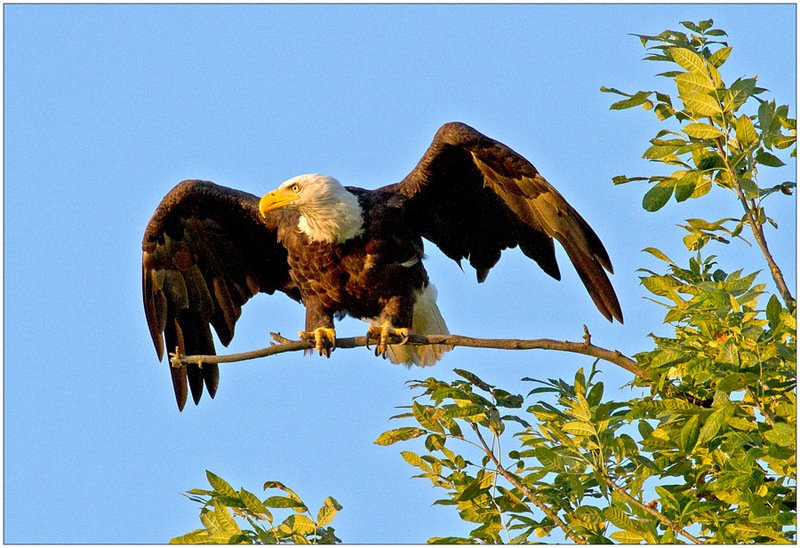 The magnificent creature perched on a branch for several minutes before flying off. I love owls and was incredulous to see one close enough to photograph in broad daylight. What a special treat! Later that evening, I hit the trails again. I ventured into the famed Hall of Mosses on my own and used the opportunity to practice a little HDR photography which really helped to capture the vivid greens of the rainforest. 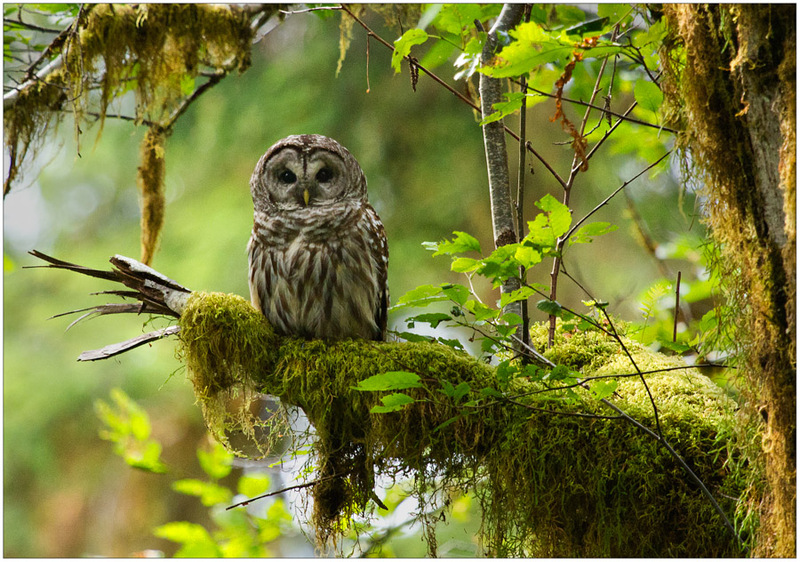 From the Olympic Peninsula, we headed south toward Portland to check out the Ridgefield National Wildlife Refuge, an area known for its prolific birdlife. We visited the refuge both in the evening and early morning and were lucky to spot some super cute river otters in addition to herons, hawks, bald eagles and ospreys. Next up, we crossed the border just into Oregon and drove the Historic Columbia River Valley Highway to see the multitude of waterfalls that can be seen along the road. Our first stop was Latourell Falls where the trails took us up above the falls and then down to its very base. 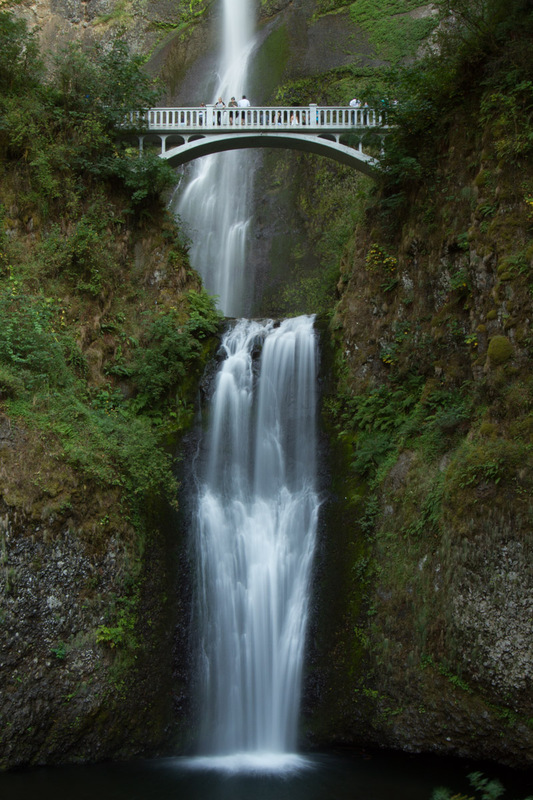 Other stops included Shepperd’s Dell Falls, Bridal Veil Falls, Wahkeena Falls, Multnomah Falls and Horsetail Falls, but our favorite had to be Coopey Falls because of its secret location. Coopey Falls is actually on private land owned by the Franciscan Sisters of the Eucharist. To see it, we had to knock on the door of their gorgeous nunnery and ask the good sisters to allow us in. They were most kind and pointed us in the direction of the waterfall located behind the residence. Coopey Falls might not be as impressive as the others in the area, but having it all to ourselves was pretty cool! 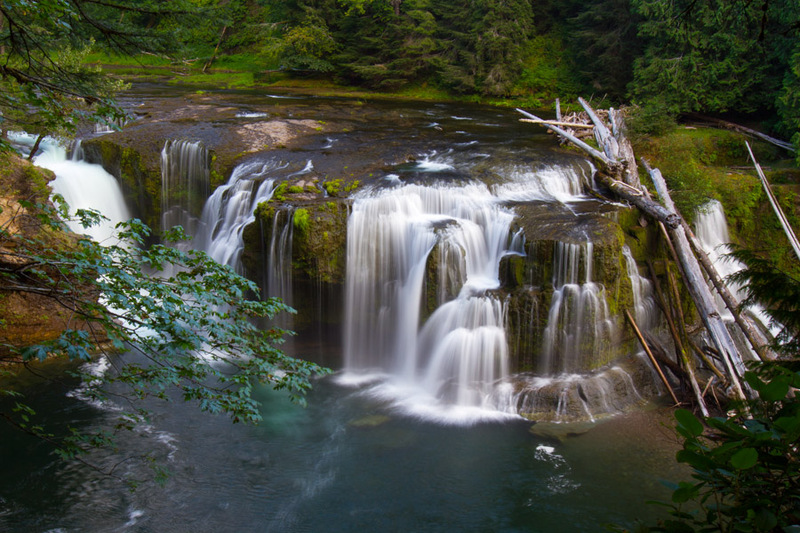 Of course, Washington has no shortage of waterfalls either. After spending the night in Oregon’s Ainsworth State Park, we crossed the Bridge of the Gods and headed back to Washington to see a collection of chutes located just north of the border in the Southern Cascades. Panther Creek Falls was our first stop. 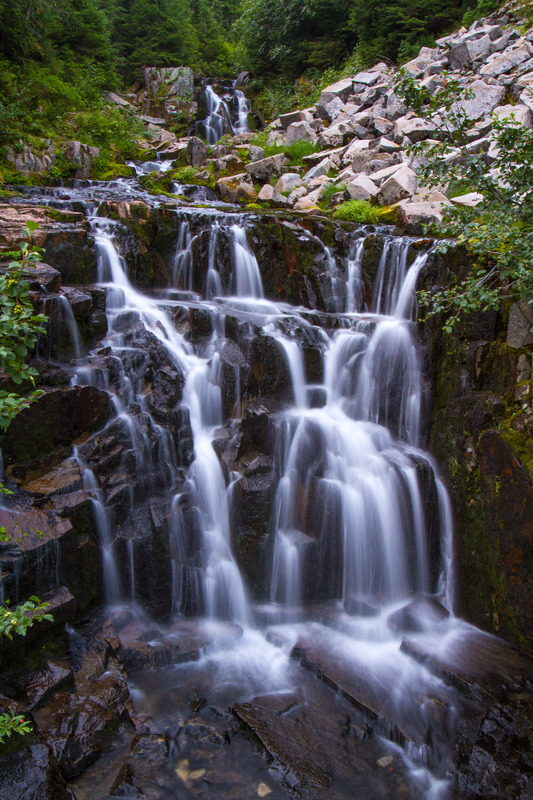 Although these falls were tough to find, it was worth the wild goose chase to get there. We read in our guide book that the best shot to be had was reached by a treacherous scramble down a near-vertical slope to the base of the falls. Not quite up for that much adventure, we stuck to the viewing platform but were none-the-less impressed by their beauty. From there, we headed for a hike to Fall Creek Falls. 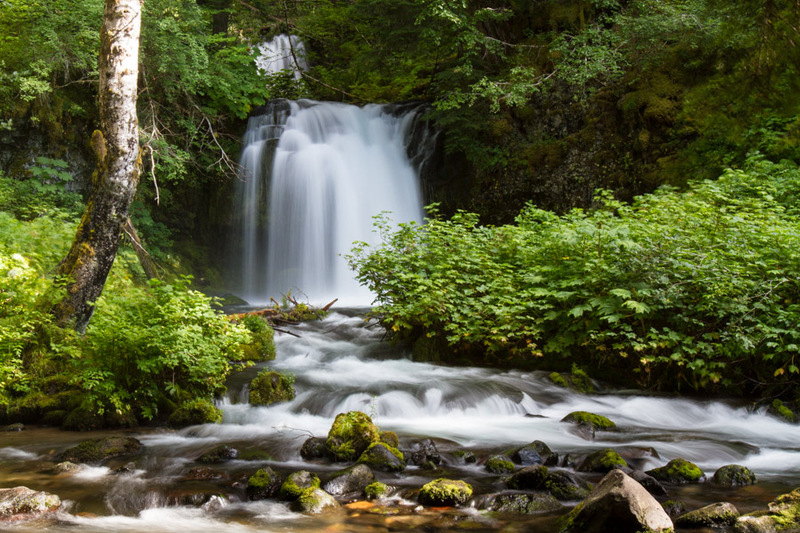 This pleasant 3.4 round trip hike leads to a striking waterfall that would make a phenomenal photographic subject under the right shooting conditions. We arrived with the sun shining brightly above the waterfall and, despite waiting for over an hour hoping for some clouds to provide some much-needed shading, never caught a break. Hopefully you can see how gorgeous this waterfall despite my unsuccessful attempt to capture it. If you decide to make the trip, be sure to time your visit for early in the morning, late in the afternoon or on a cloudy day. 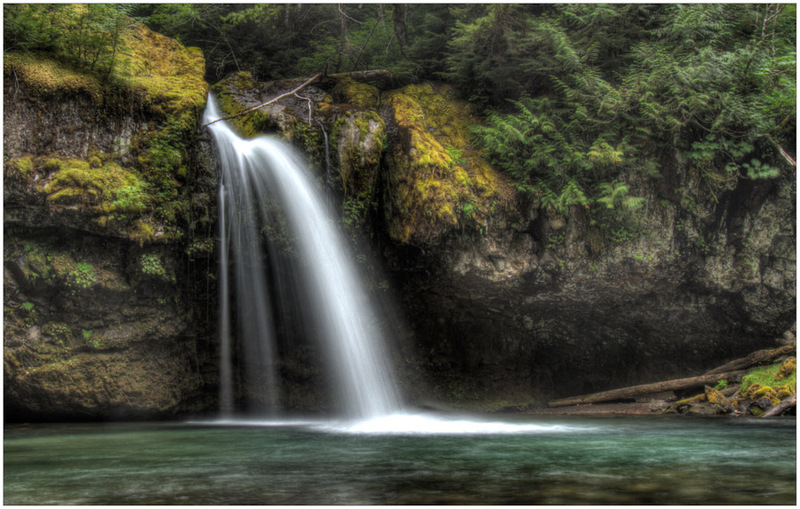 Pretty Twin Falls is a double cascade that empties into the Lewis River right across from Twin Falls Campground. I imagine that the sound of the rushing water would make a pleasant soundtrack to a night spent camping here. Even more dramatic is Lower Lewis Falls, where the falls span the entire width of the river. We took a short trail to an overlook of the grand cascade and used a telephoto lens to get some close-up details of the falls. We continued our waterfall tour on the east side of Mount St. Helen’s with a short hike to Iron Creek Falls, which, in my humble opinion, was the most beautiful of all the chutes we visited. Getting to this vantage point required crossing the shallow river and some scrambling over downed trees, but the final photo was definitely worth the additional effort to get it. On a pleasant 4.5-mile round trip hike up to Norway Pass we took in some great views of Mount St. Helen’s, Spirit Lake, and the devastation of the 1980 explosion that can still be seen today. Our second attempt at Mount Rainier was far more successful than our first. On the first morning, I woke before dawn and headed to Reflection Lakes to see if I could finally get a clear sky and some open views. 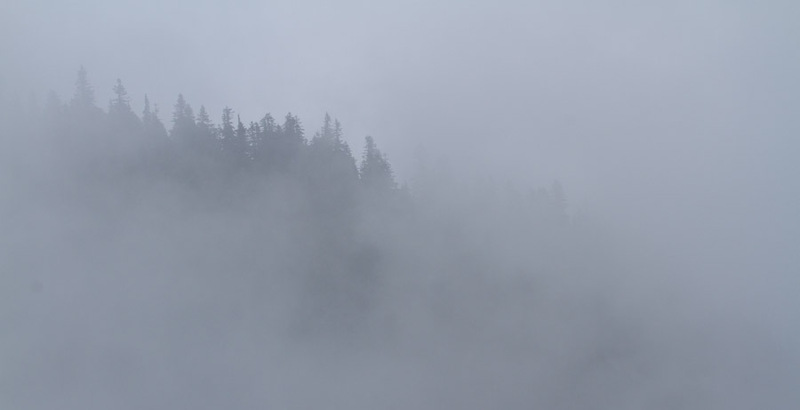 To my dismay, the mountain was completely socked in again. Determined to make something of the morning, I stopped by pretty roadside Sunbeam Falls for a photograph. On the way back to camp to get my mother, I rounded a bend in the road and couldn’t believe my eyes. 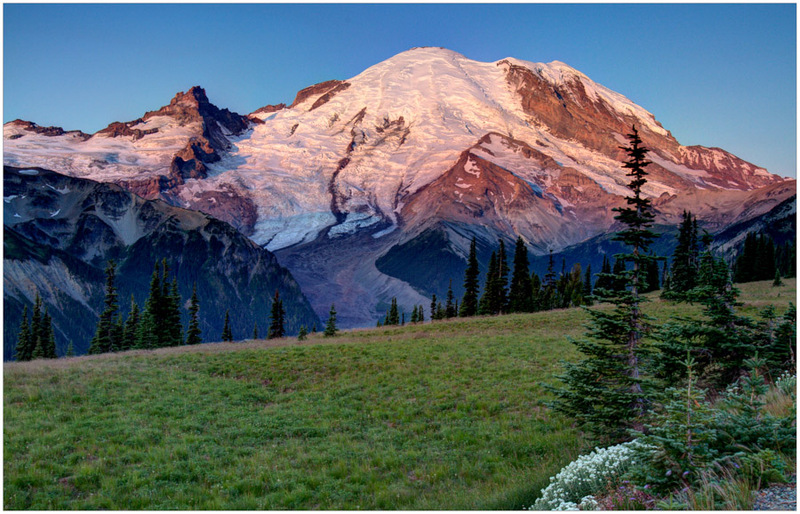 There Mount Rainier stood in all of its glory! I raced back to camp to collect my mother, and, by the time we got back to Reflection Lakes, this was view we had. I guess the third time’s the charm! With clear views, we headed back to Paradise Meadows and hiked the High Skyline Loop via the Golden Gate Trail and Skyline Trails. This was a challenging 5.5-mile hike with over 1700 feet of elevation gain, but the incredible views and gorgeous meadows made the effort worthwhile. 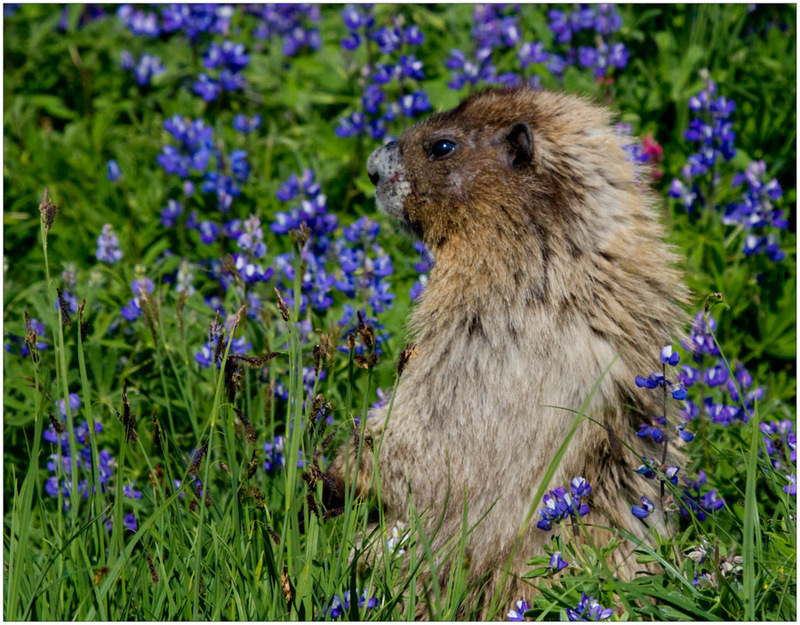 We also enjoyed observing the adorable hoary marmots frolicking in the meadows, feasting on lupine and sunning themselves on rocks. From there, we headed to the north side of the park to White River Campground where we would be within striking distance of Sunrise Point for sunrise shots of the mountain. 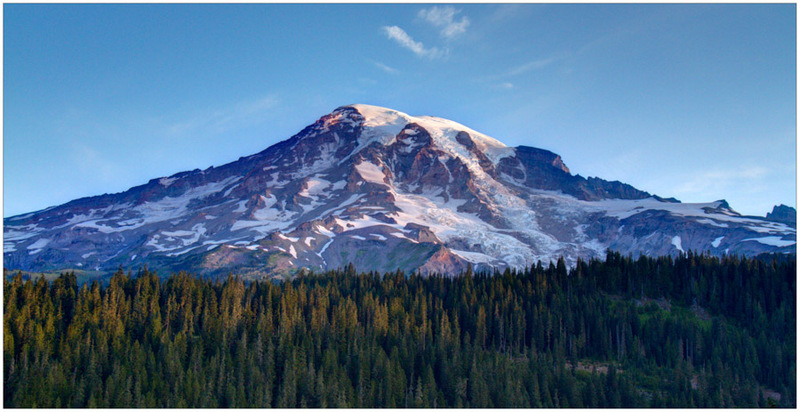 From there, we took an early morning hike up to First Burroughs Mountain for yet another glorious panorama of Rainier. 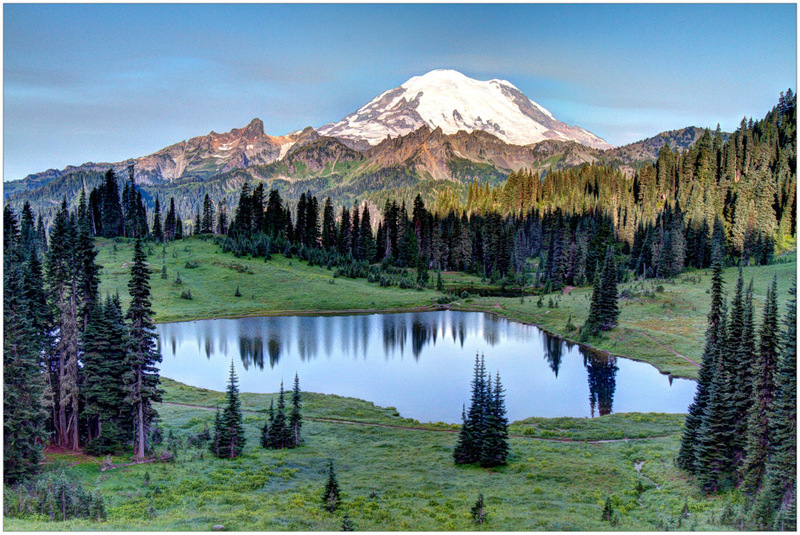 On our very last day, we headed to the eastern edge of the park where we hiked the 4-mile Naches Peak Loop Trail and took in our final view of Rainier from above Upper Tipsoo Lake. And with that, our incredible tour of the Evergreen State came to an end. In two weeks, we had barely scratched the surface of all that Washington has to offer the nature lover. Just looking at these photographs makes me wish I were there. Perhaps it’s a bit easier to understand why I am green with envy whenever I visit this magnificent state. When can we move? What an absolutely beautiful selection of photos! But you missed about 300 waterfalls. 😉 Glad you so thoroughly enjoyed your trip! And, yes, speaking from the viewpoint of an Oregonian transplanted to Washington, those from both states realize just how very lucky we are. If you don’t mind me asking, what kind of camera do you use? Thank you so much! 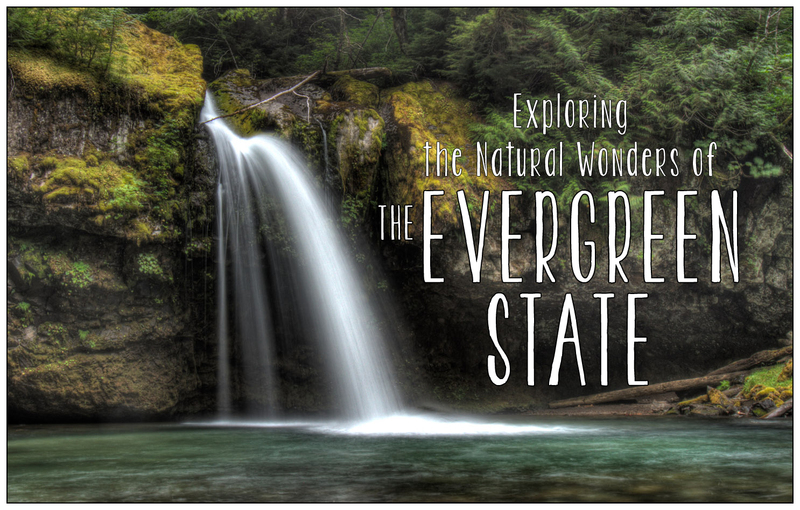 There’s so much more to see in the Pacific Northwest. We are looking forward to heading back sometime in the near future for another go at it! We shoot primarily with a Canon 7D. Our standard lens malfunctioned near the end of the Wonderland Trail, so we picked up a used L-series lens 16-35 mm f/2.8 lens at a shop in Seattle. This was the first trip using the lens, and we are pretty happy with the results. We are glad you liked them, too! Wow, what a beautiful photographs! We are off to the Shawnee National Forest in a few days with hopes that we won’t have too much rain. Thanks again for your tips on SNF. 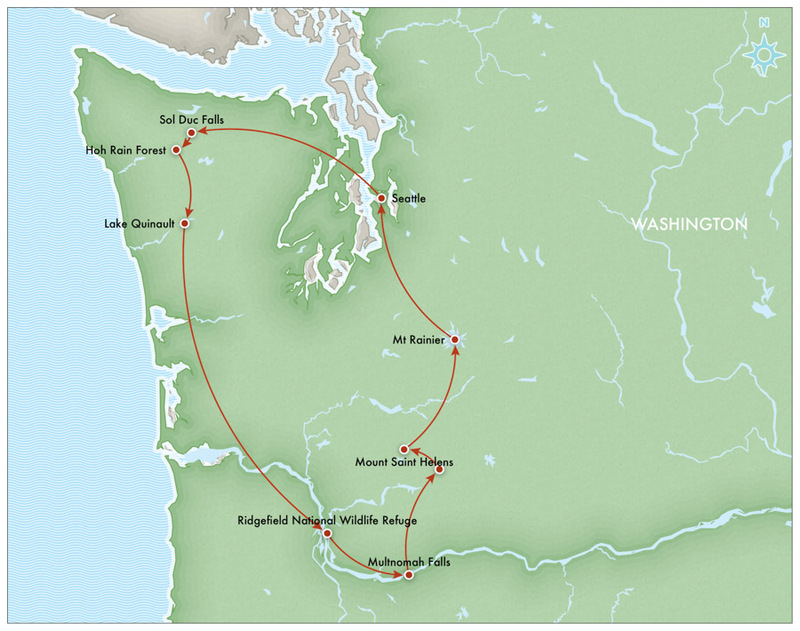 We’ll put this Evergreen State loop on our list of future trip itineraries. Thanks so much, Joann! We hope you have a wonderful time down in the Garden of the Gods area. Please let us know how it goes. Happy trails! I’m awestruck! Absolutely amazing! Very impressive photos. To the Drakensberg, no. I’m in the Cape and the Drakensberg is a long way from where I live. Hiking in the Drakensberg mountains are on my bucket list though! Best of luck. I hope you get there soon. We’d love some first-hand information from an avid hiker like you! Stunning pictures. I agree with you about Washington, I recently moved here and I’m still in awe. I love it. Lucky you! We love Chicago as a city, but there is nothing like what you all have in the Pacific Northwest anywhere close to here. Make sure you take advantage of it! What a coincidence, we moved here from the Chicago area (we lived near Six Flags). I don’t miss it! And I really feel blessed to be in the Pacific Northwest now. Wow!!! Your photography is simply amazing!!! I can’t believe how gorgeous these photos are. Very well done. Thanks so much, Brittney. That’s very kind of you. This trip with my mother was fun because I really got to focus on finding beautiful places to photograph. It’s hard to go wrong in Washington. Almost anywhere you point the camera is gorgeous! I really loved looking at your pictures. They are so full of color which really shows off the beauty of nature –just awesome to look at! There’s nothing like hiking to bond families together, and I am glad you two hikers had a grand road trip of the Pacific Northwest! Thanks, Andy! You know how I always look forward to my annual summer trip with my mother. We always have a great time together, and the location of this year’s trip couldn’t be beat! As a Washingtonian, I can say that everyone who lives here knows exactly how lucky they are. We live live in the most beautiful state! And that’s probably why we’re all so obsessed with being outdoors constantly. You know, I was reading this Vox article (http://www.vox.com/2015/4/23/8479241/map-online-dating-profile) the other day that said the most popular “distinctive” word in Washingtonians’ online dating profiles is “hikes.” I don’t question that for a second! Very interesting, Megann. 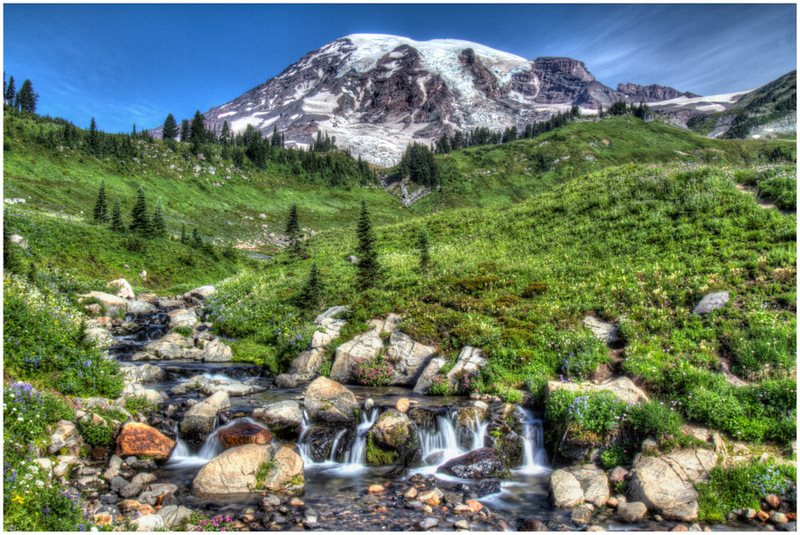 We are glad to know that most Washingtonians take advantage of all the natural beauty around them. Cheers! I enjoyed my vicarious adventure via your stunning photographs, especially of the waterfalls and wildlife. Thank you! Washington is a seriously stunning state. We are always grateful to spend some time there. Have you been?